What does hermeneutics mean? Where did the term originate and how is it used in day-to-day life? 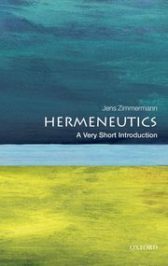 Jens Zimmermann, author of Hermeneutics: A Very Short Introduction, tell us 9 things everyone should know about hermeneutics. Hermeneutics is all about interpretation in fields of study, such as interpreting plays or novels, but also in day-to-day life, when we interpret actions of our friends or try to figure out what a job termination, for example, means in the context of our life story. Hermeneutics is the art of understanding and of making oneself understood. It goes beyond mere logical analysis and general interpretive principles. The word ‘hermeneutics’ comes from the ancient Greek language. Hermeneuein means ‘to utter, to explain, to translate’ and was first used by thinkers who discussed how divine messages or mental ideas are expressed in human language. Hermeneutics is also the name for the philosophical discipline concerned with analysing the conditions for understanding. Hermeneutic philosophers examine, for example, how our cultural traditions, our language, and our nature as historical beings make understanding possible. Hermeneutic thinkers argue that understanding is the interpretive act of integrating particular things such as words, signs, and events into a meaningful whole. We only really understand an object, word, or fact when it makes sense within our own life context and thus speaks to us meaningfully. Philosophical hermeneutics refers to the detailed and systematic examination of human understanding that began with the German philosopher Hans-Georg Gadamer (1900-2002). He argued that our perception of the world is not primarily theoretical but practical. We don’t assess objects neutrally from a distance, but they disclose themselves to us as we move around in an already existing totality of meaningful relations. Modern hermeneutic also has to ask how the digital revolution changes the conditions for understanding texts. For example, text encodings are already an interpretation and different search parameters represent texts through a particular, pre-selected focus. The ancient Greek philosopher Plato (427–347 BCE), used the word hermeneutics in dealing with poets as ‘hermeneuts of the divine’, and his student Aristotle (384–322 BCE) wrote the first extant treatise on hermeneutics, in which he showed how spoken and written words were expressions of inner thoughts. Hermeneutic thinkers claim that our modern consciousness has been shaped in such a way that we imagine ourselves as ‘islands of awareness’ floating in the grand ocean of life, disconnected from other selves. The Canadian philosopher and hermeneutic thinker Charles Taylor labelled this specious self-contained consciousness as a ‘disengaged self’. Featured image credit: books by Chris Lawton. Public domain via Unsplash. Jens Zimmermann is Professor of Humanities and Canada Research Chair for Interpretation, Religion and Culture at Trinity Western University, Canada. He is the author of Hermeneutics: A Very Short Introduction. Fantastic introduction. I really enjoyed this. I remember the word from university but had not much idea what it meant. Point 9 regarding modern consciousness is a bummer…, what to do? It is important for all the Ministers to be a student of the school of thought. I need to know much more.